These seeds love full sun and the clay balls keep seeds from washing or blowing away. You will be amazed by the results. 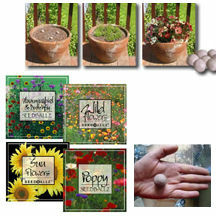 Each pack has 8 seed balls, each ball up to 25 varieties and hundreds of seeds. Place in gardens, open ground or pots, wherever you want flowers. Just spread seed balls on the ground. No need to bury, just water. Keep moist until the seeds sprout and then only as needed. These seeds love full sun. Will germinate in 7 to 45 days depending on the seed. Beautiful colorful blend of over 20 flowers irresistible to Hummingbirds and Butterflies. A dramatic display, over 25 varieties, lots of color for years to come, without any of the work. Loads of seeds, so each ball will make a spectacular cluster of flowers. 10 different sunflowers in each clay ball. For the connoisseur of color, this mix makes a dramatic presentation in any location garden, pot or open ground. Each ball has one type of seed, each pack has 8 balls, 4 herb varieties: Thyme, Basil, Parsley, and Chives. Need FULL sun. For breast cancer support, $1 per pack goes to breast cancer research. All pink flowers. Mix of annuals and perennials. Needs FULL sun. Order 5-8 packs — $6.75 each Save 10%! Order 9-12 packs — $6.50 each Save 13%! Order 13 packs or more — $5.75 each Save 23%!